" I was introduced to Leong Hwa Monastery by my friends...I made the first trip there with my son..." related by Mdm Tan Ah Moey. That was 5 years ago and today, she is a familiar face at the Monastery. She is there at least twice a week both as a devotee, participating in the prayer sessions as well as a volunteer helping at the kitchen. The regular visits to the Monastery and the warm shown by the Monastery' Abbot, Ven. Sek Meom Ee have helped her pulled through the difficult times especially after the loss of her only son. 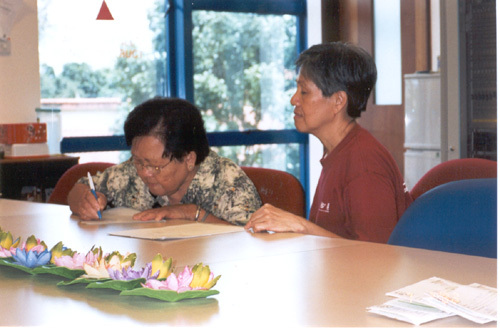 She commented " The Abbot is a great individual, a very nice person..." With that respect and desire, she has willed her only valuable assest, a 4-room HDB flat to the Monastery and its community service arm, Viriya Community Services. She truly believes that Ven. Sek Meom Ee will help her to fulfill her wish.